Sen. Jim DemInt, R-South Carolina, is concerned about the TSA's involvement in collective bargaining. Washington (CNN) -- Senate Majority Leader Harry Reid intends to force a vote on Erroll Southers' nomination as the next Transportation Security Administration director when the Senate returns in mid-January, despite the hold Republicans have placed on the nomination. Top Republican senators including Sam Brownback, Tom Coburn, Chuck Grassley, Mike Johans and John McCain have expressed "serious reservations" about Southers' ability to lead the TSA and have sent a letter to the White House this week expressing their concerns. At issue: Southers' testimony before Congress in which they say he gave incomplete information about accessing a federal database for personal reasons. The move led to his censure from the FBI. "We believe that Mr. Southers submitted erroneous, and possibly misleading, information regarding ethical violations during his service with the Federal Bureau of Investigation," the letter said. "In light of this, there are a number of questions that must be answered so the Senate can effectively render its Constitutional responsibility to advise and consent." Coburn will "object to Mr. Southers' nomination moving forward until he provides the committee with a more complete and accurate description of the circumstances surrounding his censure and subsequent failure to provide the committee with key information," Coburn spokesman John Hart said Wednesday. The holdup over Southers' confirmation comes as the agency is under the microscope after the failed Christmas Day terrorist attack on a Northwest Airlines plane heading to Detroit, Michigan. Gale Rossides, a holdover from the Bush administration, is serving as acting director. Southers, assistant chief for homeland security and intelligence at Los Angeles World Airports Police Department, was nominated by President Obama in early September. The airport's police department, which he has helped manage since 2007, is the largest such operation in the country, with around 1,200 employees. The recent events come in the wake of DeMint objecting to Southers on concerns over the TSA becoming unionized. DeMint is focused on the Obama administration's support for unionizing the TSA, which is made up of approximately 50,000 employees, including screeners and an undisclosed number of federal air marshals. Right now, all members of the TSA are able to join a union; The TSA does not have a separate union. But for DeMint, the key issue is whether collective bargaining -- a union tactic allowing workers to organize together and negotiate on issues such as hours and wages -- will be implemented if Southers takes over. "Collective bargaining would bring the security concerns of TSA under the authority of union bosses," DeMint said on Sunday's "State of the Union" with John King. "Airport security does not need to go to union bosses at this time and get their permission to change their security protocol." Not so, according to John Gage, national president of the American Federation of Government Employees, which has represented the TSA workforce since the agency was created in 2001. "The law is so strong and so clear, and for him to say that a union boss would determine deployment of transportation security officers is worse than a lie," he said. 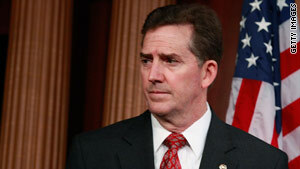 "He [DeMint] really gives hypocrisy a bad name. He knows that collective bargaining in the federal sector cannot affect national security in any way." About 12,000 dues-paying TSA members are employed at more than 100 airports in 36 union locals nationwide, according to AFGE's Web site. The union also is the largest federal employee union, which represents 600,000 federal government and Washington workers. Gage noted that collective bargaining is used in other agencies such as Border and Customs Protection, Immigration and Customs Enforcement and the Department of Defense, to name a few. Obama's choice has been well-received by unions and airport screeners, who say Southers will embrace collective bargaining for screeners. "We believe the best way to build power for all TSOs [transportation security officers] is to join AFGE and the 11.5 million members of AFL-CIO affiliated unions," Richard Trumka, president of the AFL-CIO, said in a statement in December. Screeners had an often-hostile relationship with the Bush administration, which opposed unionization and said it would hinder the agency's ability to quickly respond to emergencies. "Collective bargaining ... would put American lives at risk by preventing the TSA from responding rapidly to new intelligence and by replacing merit promotions with seniority schedules," labor expert James Sherk wrote on the Web site of the Heritage Foundation, a conservative think tank. "Congress should consequently wait to confirm any nominee to head the TSA until that nominee states his or her position on mandatory collective bargaining over security procedures." But Gage argued that is not the case. "There was no one checking their union contract when the cops and the firemen went up the World Trade Center steps or when our two officers, who were AFGE members, took the Fort Hood shooter down," he said. Issues over airport workers also stir up memories from the Reagan administration. During his first term in office, President Reagan fired 11,400 striking federal air-traffic controllers. The controllers defied federal law, which prohibited strikes by government employees, after their union failed to reach an agreement with the government over wage increases. Could Obama do the same thing? Yes, Gage said, because "that's the law." He said that the issue of striking TSA workers would probably not even get to Obama. "If there was a strike, let's say, at JFK by transportation security officers, it wouldn't take Obama to have all these folks fired. They would be fired instantly within the agency." DeMint is adamant, though, that it appeared Southers was chosen to "bring everything under collective bargaining at a time when we need to focus on security." But Sen. Claire McCaskill, D-Missouri, said the holdup is unnecessary. "This is nuts, holding him up over whether or not somebody is going to be able to bargain for better benefits," she said Sunday on "State of the Union." "This man is focused on the mission of this agency," she said. She said it's important to get past the habit in the Senate where one or two senators can stop the process from moving forward. McCaskill predicted that Southers would be confirmed "by a wide margin." "And playing games with the process, all it's doing is hurting the traveling public, because the most important front-line agency to protect Americans right now on flights is being held up over political stuff," she said. CNN's Mike M. Ahlers and Evan Glass contributed to this report.